If you have ever wondered which substances in cigarettes are cancerogenic, read our list of the 7 Chemicals in Cigarettes That Cause Cancer where you will find chemicals such as benzene, aldehyde and other toxic substances. Scientific evidence which prove that smoking cigarettes causes different types of cancer has been accumulating over the years. Around 1 billion people in the world smoke and almost half of them die as a direct result of smoking. Nicotine addiction causes many diseases, including different types of cancer, among which lung cancer is the most prevalent. According to American Cancer Society, smoking is responsible for 80.2 percents of deaths from lung cancer. It is also one of the leading causes of larynx, throat, esophagus and bladder cancer. In USA about 480,000 people die each year from smoking-related illnesses, around 150.000 from lung cancer alone, which means that smoking kills more Americans than alcohol, car accidents, suicide, AIDS, homicide, and illegal drugs combined. These bleak figures are hardly a secret. Almost everyone knows that smoking causes cancer, but as any smoker would tell you quitting isn’t so easy. In the USA 70 percent of nicotine addicts would like to quit smoking, but the success rate among those who try to quit without any help is only 4 to 7 percent. The success rate rises among smokers who rely on some sort of assistance in fighting their addiction. Besides medicament assistance, different sorts of counseling as well as joining self-help group such as Nicotine Anonymous can be helpful. So why is it so hard to stop smoking? On one side, tobacco companies are spending a lot of money to convince people to buy their product. You can check our list of 11 top selling cigarettes in the World and see it for yourself. On the other side, nicotine is a substance which is highly addictive. GM Heyman presents data that show that it is easier to stop using cocaine then quitting smoking. It isn’t entirely clear how nicotine creates addiction and the question still raises a lot of debate among scientists. However, it is known that nicotine increases production of two chemicals in the brain – acetylcholine and dopamine. Acetylcholine is believed to play a role in learning and memory, which is why smokers often say that lighting cigarette helps them to concentrate. On the other side, dopamine is associated with brain’s reward and pleasure centers. Pleasurable experiences trigger the release of dopamine which is why our brain is making us repeat the activities that bring pleasure. When a person stops using nicotine, withdrawal symptoms appear. These symptoms may range from mild to severe and they include physical symptoms such as headache, constipation, tremor as well as psychological – altered mood, nervousness, anxiety even depression. The brain, which got used to nicotine, or better say dopamine, suddenly feels that it lacks something – ex smokers often report that during their first days of smoke-free life they had overwhelming sense of lose and emptiness. While no one doubts that it is hard to quit, there are many reasons why smokers should never stop trying to get rid of the addiction. 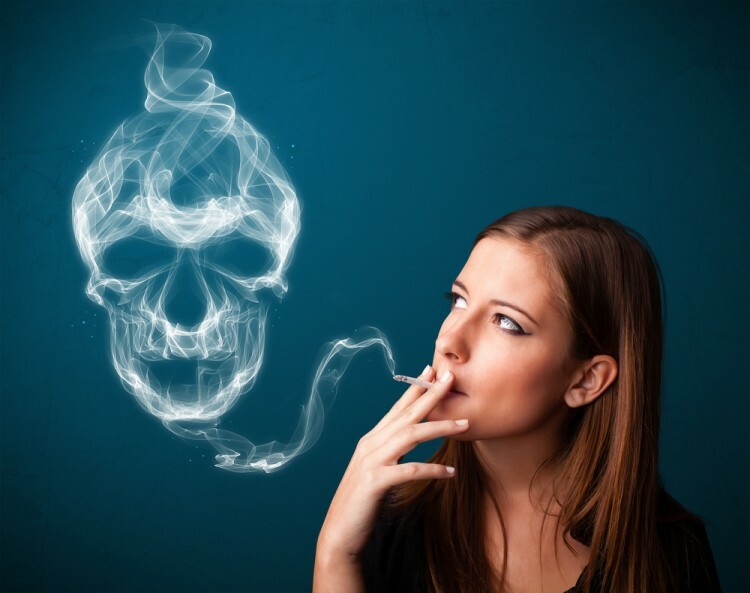 Tobacco smoke contains over 5,300 compounds, among which more than 70 are carcinogenic. We made the list of 7 Chemicals in Cigarettes that Cause Cancer using the monograph of International Agency for Research on Cancer, published in 2012, as well as highly cited article Tobacco Smoke Carcinogens and Lung Cancer written by Stephen S. Hecht and published in 1999. We used these two sources to identify carcinogens in cigarettes, and we have chosen to present you these seven chemicals using two criteria – its concentration per cigarette and its carcinogenic potential.